Adriaens, P., & Gibbins, C. (2016). Identification of the Larus canus complex. Dutch Birding 38 (1): 1–64 [treats brachyrhynchus as a separate species]. 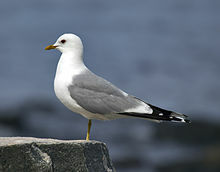 For more multimedia, look at Larus canus on Wikimedia Commons.